“One thing you can feel good about, Chris, is you are going to recover from this.” When I heard those words come out of my son’s doctor’s mouth I felt a weight lift off of me. I had heard about concussions, but this was the first time I really understood the seriousness of this type of injury. My son is an avid hockey player. 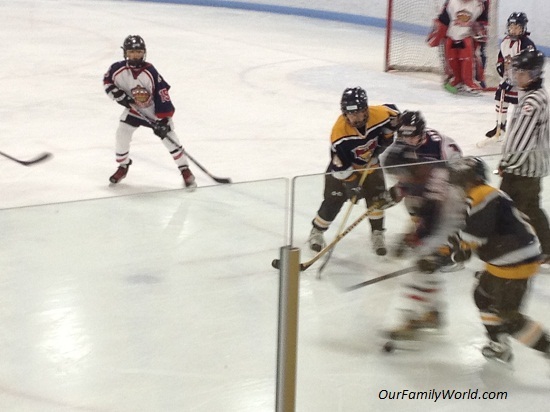 He participates on a traveling team, so we are pretty busy watching or traveling to hockey events on the weekends. I love to watch him play and to see his excitement over playing. However, without fail, a puck or two will slam into the plexi- glass and make me jump. I cringe when it happens now even more, as a about a year ago one of those stray pucks smack into my son’s head. I panicked, of course. But luckily, Chris’s coach pulled him off the ice. He said he wouldn’t put him back in until a doctor saw him, because of a new law in our state on concussion in sports. I was shocked at first, wondering if that was really necessary. I knew my son would be angry for being held out. But looking back now, I am so grateful that law required Chris’s coach to take a training on concussions. He knew exactly what to do to protect my son from further injury. The signs of a concussion were evident within days. Chris is fully recovered after one year. During that year, he couldn’t play hockey or even watch games. He felt tired and sensitive to sounds. It’s probably one of the hardest things he’s had to deal with. It’s very scary as a parent, to watch your child go through it. You always assume that you or your child won’t get a concussion, because they are wearing a helmet. Also, that is something you always hear about, but it never happens to you. From my experiences, I want to share what I have learned for other parents to learn too. Concussions are a serious injury! You should learn concussion signs and symptoms and how to respond if a concussion is suspected. And just as important, make sure your child’s coach and other parents are aware as well. You might not be at every practice, or you might miss the fall. Finally, you should find out if there is a law in your state on concussion in sports. Most states do. These laws require coaches to take a yearly training on concussion and mandate that an athlete with a suspected concussion is removed from play until cleared by a health care professional. Chris is now back in school and doing well. However, it could have turned out different if our coach was not prepared and knew how to respond. And because of that, I am a happy hockey mom. Concussion is really bad but some people thought contusion is the serious type. I’m glad your coach knew what to do and that your doctor took it seriously. I read about a kid that didn’t have that and he ended up dead because they didn’t know. Thanks Elle! I hope that more and more coaches are aware of these risks. I agree with you completely Ashleigh. It is so hard as a parent to watch out children get injured. We are always torn between supporting their choices, but wanting to keep them close and protect them from harm. We can’t keep them wrapped in bubble wrap, but I don’t think that death is a good option either. What are we to do? There was a child 7 years old that died in a lacrosse around here recently. He was hit right in the heart with the ball. I am so terrified to enroll my son in sports when he’s older but I don’t want to hold him back. I’m glad to hear your son is okay now. The boy suffered commotio cordis – sudden onset of an cardiac arrhythmia; usually ventricular tachycardia or fibrillation. Both are fatal, if not treated immediately with medications, cardioverson or defibrillator. The syndrome usually affects people with previously undiagnosed heart disease. Most youth sports require physicals because of this, and other problems.